44 ⅜ x 57 ⅜ in. Jacques Grief was born in Dordrecht, a small river town in northern Holland. Because of a physical deformity, he was given the nickname of "de Claeuw," meaning "the claw." The artist, a brother-in-law of the painter Jan Steen, was known for his still life images. Popularized as an independent genre by Dutch artists of the period, still life appealed to the taste of Calvinist patrons who objected to overtly religious art. 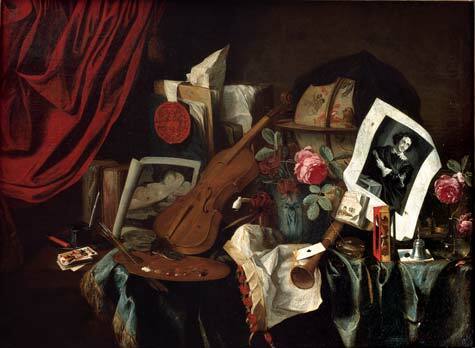 The term vanitas (Latin for "emptiness") is applied to still life images featuring objects that represent the brevity of life or the emptiness of worldly concerns. De Claeuw's contemporary public was familiar with such symbolism and would have recognized the partially covered celestial globe as an attribute of astronomy. The globe, along with a copy of the Amsterdam Waersegger Almanach (1677), a soothsayer's almanac, refers to man's inability to accurately predict the future. The musical instruments, inkwell, sealing wax, and cards refer to the vanity of worldly amusements. The hourglass and the smoke associated with the pipe and candle denote the passage of time. The flies and flowers are symbolic of decay and the shortness of life. The image of Venus refers to the impermanence of physical beauty. The small portrait of the prominent engraver Pieter de Jode (1604 – 1674) is a reference to the immortality an artist attempts to gain through art.